I'm an American who fell in love with San Miguel, so I built a second house here. My three bedroom, two and a half bath home features all the charm of colonial architecture! 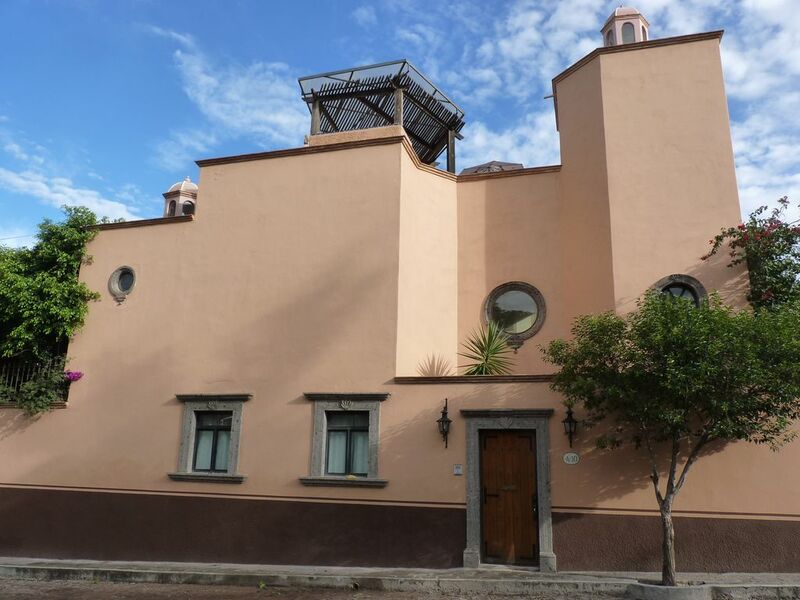 The architecture includes Saltillo tile floors, wood beam and boveda ceilings, oval stone windows, stone fireplaces in the living room and master bedroom, hand-painted tiles in the kitchen and bathrooms, balconies off all of the bedrooms, and a tree-filled courtyard with a cantera fountain. I personally furnished and decorated the house with folk art and pottery collected for the past 30 years. The home also offers all the conveniences of a new home including purified water, a wet bar in the living room, modern kitchen with dishwasher and six burner gas stove with grill, remote control fans in the bedrooms, intercom system, Satellite TV, Wi-Fi, High Speed Internet, phone, gas fireplaces and private off-street parking. The rooftop terrace offers incredible views of the city and surrounding area, plus it's a great place to enjoy tequila sunsets and starry nights. The house is extremely comfortable and is a great place to relax and feel at home. Young Children and Pets are NOT allowed. No Smoking. The home is situated in a safe and quiet neighborhood within walking distance to the center of town. The world famous Instituto Allende is just a few blocks away where classes in language, writing, and the arts are offered. A large supermarket, Mega, is just a short walk or cab trip from the house. One of the best features of my house is that it is very affordable so that all can enjoy SMA as much as I do. San Miguel is listed as one of the ten best vacation destinations in the world for the last three years according to Conde Nast Magazine. This cosmopolitan city has first-class restaurants offering smoked salmon with capers as an appetizer as you make your selection from a gourmet menu. The Mexican Government declared the center of town as an historical site in 1926, so as you walk the cobblestone streets, you experience a time of yesteryear. Shops that were once grand haciendas are now filled with Mexican folk art, antiques and beautiful hand-painted pottery. SMA is known as a mecca for artists and art lovers. Bring your laptop and stay in touch with family and friends. Balconies off all of the bedrooms. Enjoy your coffee while reading the morning paper.